Emillie Ferris // Illustrator // Leamington Spa, U.K. Check out more of her amazing work at her Website or Instagram. I could rave about the Internet for days! I believe it's so important to take a step back and just admire what it's done for so many of us who have found their business through it. It was through the Internet as a young girl that I started to look at other people’s artwork (mostly through deviantart) I believe I was probably googling fanart for books I was reading at the time, and I remember it would blow me away looking at how people had used their imagination to bring the characters to life <3 At this age (around 11) The idea that illustrators like Quentin Blake illustrated for their adult jobs was so out of reach to me, it sounded so fun and perfect that I think I convinced myself from that point that when I was a grown up there was no way I could do that! I always kept drawing, and expressing myself creatively though (mostly through photography) and it wasn't until I was 19 that I found the medium of Embroidery. Now, you may have heard of this amazing platform called Instagram ;) but this creative community just worked wonders for me! It's like you go to work and all of your colleagues are there, but they are also creating their own awesome work, and alongside that they are encouraging you with yours! So, through the Internet I've been able to follow my little girl dreams to 'draw when I'm older'. I’d say it has had an extremely positive impact on my life! I'm really drawn to creating images of British wildlife, and I think growing up in the Suffolk countryside contributed to that. Though it wasn't until I moved to a town for University that I found myself wanting to keep in touch with these roots, and voila, My woodland embroidery hoops started! I work mainly from reference images which I'll merge and form together in Photoshop until I'm happy that it's matching the vision I wanted :) Social media has definitely altered my design process, due to the amount of requests and emails from my followers, I started to realise there was a huge niche gap in the market for hand embroidered pet portraits! And I thought, hey, why don't I just go for it! I have found a few examples of people using my literal images on products they were selling abroad without my permission, but I have been fortunate so far to have not seen any actual embroidered copycats of my designs (maybe I haven't looked hard enough). 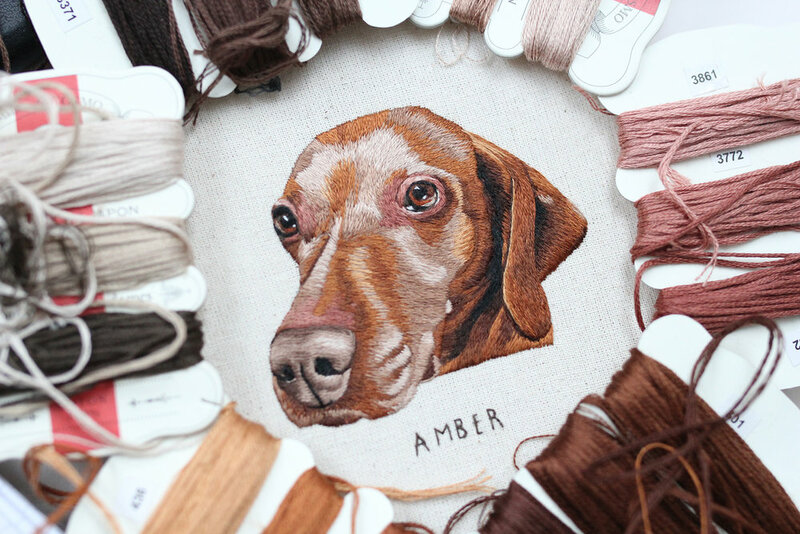 Since I started embroidering pet portraits, there does appear to be this huge influx of people doing the same thing! Don't get me wrong though, I 100% wasn't the first person to think of the idea! Before I went ahead with my first pet portrait I wanted to make sure I wasn't going to step on anyone's toes! The ONLY people I found that did them were Hiroko Kubota and Nichole Lynn Alvarado. When I saw their embroidery I told myself that I would never ever ever embroider a pet on a shirt pocket like Hiroko. This is her own distinct style, and despite people emailing me to see if I could, I always turn them down and point them in her direction :) Nichole has her own style for her portraits too, hers are very fun and a little more abstract as she uses more strands of embroidery thread than myself. Stitching Sabbatical started her pet portraits around the same month I did I think! Haha :) there are a few slight copycats now, but luckily due to the detail and time I put into my portraits, there luckily hasn't been anyone I've had to confront (just yet!). I'd say get your social media hat on! Learn photography, get a good camera if you can afford one. Most importantly find your style, do what you love, not what you think others will like! Finding your niche can take time, and even now I still don't think I've found my thing yet, but without trying to sound cliche: if you haven't created something you love today, there's always tomorrow! Here are a few I can think of from the top of my head! :) There are definitely more than this, but sometimes I forget their names until I see their insta feeds/website and find myself ogling for hours!